What is the first thing you do on waking up and the last thing you do before sleeping? Check your cellphone! !I KNEW IT !!! I do it too. Today, Cellphones , Smartphones , Tablets etc.have become our extended Body Parts.We feel lost if we don't have our cellphone with us even if it's just for 10 minutes. I noticed it, when I forgot my cellphone at home and left for the gym. And since I'm not much of a Gym Socializing type of guy, I felt lost... in between exercise sets. Though smartphones and other gadgets have made our life easier, there's one area where they are a Pain in the Neck...Literally. Overusing your Cellphones, Laptops etc.in a bad posture is a leading cause of the nagging ache in your Neck/back/shoulders. We tend to get super engrossed into the phone, laptop or the book , so much so that we lean forward and almost get inside the screen of the gadget. 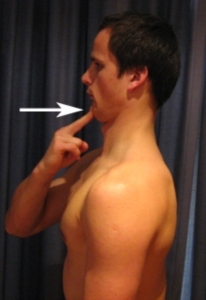 This is a very bad position for the neck and causes a change in the natural alignment/curvature of the neck, thus resulting in "Forward Neck" or a "Text Neck". 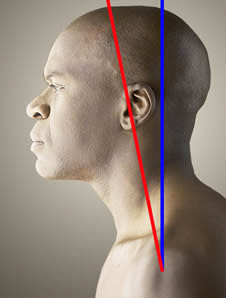 Usually for most, if your EARS are not in line with your Shoulders, you most probably have a Forward Neck. The further ahead your ears are from the shoulder line , more severe is your Forward Neck condition. This not only results in Neck Pain, but also causes, shoulder pain, headaches and back pain. 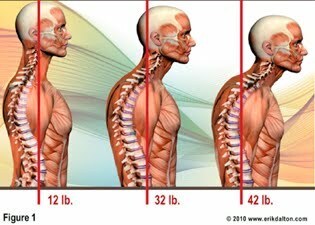 Sometimes you can get rid of severe pain in the Neck , shoulder or your back by a simple correction in your neck posture. If you are suffering from nagging pain in the above 3 areas, chances are you have a Forward Neck. Tell somebody to check your neck position while you normally stand straight without any external force or pressure on your neck to keep it back. If your ears are not in line with your shoulders .... work towards getting them in line with your shoulders to avoid any aches/pains in the future or to get rid of any aches/pains you are currently suffering from. Why should you correct your Forward Neck? The average Human Head weighs approx 10-15 Pounds. Hence, you must correct your Forward Neck as soon as possible to avoid any permanent damage to your posture and spine. Use your fingers to guide your chin and tuck it into your neck in the best posture possible so as to align your ears and your shoulders. Hold this position for 10 seconds.Relax and repeat. Do this 5-10 times. Door Frame Chest Stretch and Back contraction: Stand in a door frame with arms on the side, resting on the door frame and lean ahead slowly in a controlled manner till you feel a nice stretch in your chest muscles. Also try and contract your back muscles while doing this to simultaneously strengthen your back to hold you in this new favourable position. Hold this position for 20-30 seconds. Repeat 3-5 times. You must perform these 2 exercises every alternate day to correct your Forward neck. If you read my Profile, it says "A Fitness Professional, (Certified Fitness Trainer ranked Among top 5 Percentile of the world from International Sports Sciences Association(ISSA), California,USA) & a Music enthusiast , who now works in Financial Services to make MONEY.."
True, I wanted to become a Fitness Trainer, which I did for some time... only to realize that I wanted to see bigger numbers in my Bank Account. So, I went on to work in Financial Services. I'm happy with the numbers now. I am also lucky to have a Boss who believes and follows " Come on Time and Leave on Time ". So, I find time to workout for 40 -50minutes thrice a week to keep myself fit. But I see a lot of people whose Bosses "Come Late and leave late" .. or "Come early and leave late" .. or "Come whenever ,leave late" . And in the cut throat corporate environment , if your job pays you well ,your boss won't let you go home without extracting a good amount of work from you. True Story. Hence , it's time to introspect on ,whether you have traded your health for a "Large Credit Alert" in your Bank Account at the end of every month. Look around and you will see a lot of people with a lot of money, on the verge of being hospitalized. Makes you wonder whats the use of making so much money at the cost of your health, when eventually all you can do with it is, check yourself into a "Deluxe Suite" of a Five Star Hospital? But instead, as we make more money, What happens is..
Live in a big house: So you bought yourself a pent house or a 2 storey Bungalow,only to realize you can't go to the first or the second floor, because your body refuses to climb stairs. In a nutshell , all the money in the world is not worth earning , if it doesn't help you live a happy , healthy & a fulfilling content life. I'm not saying one shouldn't aim to make money , because being FIT only isn't going to feed your children. But, if you are fit, you don't have to be at the mercy of anybody/any situation in life , because your body will support you in executing whatever it is that you decide to do. Being fit makes you Independent, Strong and Self Sufficient.Happiness comes from, being able to do what you want and your body supporting you in your decision to do that. You think Sky diving will make you happy. Go ahead and do it. And before you do it thank yourself for keeping your body in a state where it can Sky dive, because there are a lot of people out there , who want to sky dive, but they can't because their bodies wont support them. So , do whatever it takes to find some time for yourself, for your body, for your health and for your happiness. To Sum up, I strongly feel, Money alone cannot make you happy. What you do with that money ,is what makes you happy. And without being fit you cannot do Everything you want to do with your money!